A visit to From the north to the south, Australia is full of interesting sites and unique tours to experience. During your trip, you have the opportunity visit the main sites in Sydney including the Opera House and the Blue Mountains, snorkel the Great Barrier Reef, and explore the Kuranda Rainforest. You may also experience Tjapukai Aborigine as well as Uluruu (Ayer’s Rock) and the Olgas, learning the Aboriginal stories of these sacred sites. Kangaroo Island offers amazing encounters with wildlife including sea lions, penguins, koalas, wallabies, and of course kangaroos. Meanwhile, a drive along the Great Ocean Roadtakes you on a gorgeous expedition along majestic coastline. A short distance off the mainland, Tasmania is another beautiful part of Australia with great national parks, wildlife, food, wine, and breathtaking scenery. Fiji is also an island paradise – but generally with a significantly lower price tag! You can experience many beautiful beaches, fantastic resorts, overwater bungalows, fantastic snorkeling and diving, great food, drinks, sunset, etc. Fiji also has many soft adventure options such as white water rafting, zip lining through the high canopies, etc. etc. You can even rent your own private island and stay at an exclusive resort. We can take care of it all: Book your flights, your hotels, help you plan your trip to your exact specifications and even open up some possibilities that you did not know existed. From the majesty of Mount Cook, to the geysers at Rotorua; from the delightful friendliness of New Zealanders, to the rich culture of the Maori; from the man-made wonder of KellyTarlton's Underwater World, to the natural beauty of glow worms in Waitomo caves, numerous experiences and sites await you in New Zealand. Our tours include major highlights of theNorth and South Islands such as the City of Sails(Auckland), the Garden City (Christchurch), the gorgeous beaches in the Bay of Islands, the adventure Capital(Queenstown), and more. This is a land full of spectacular views (popularly known for its use as the dramatic setting for the "Lord of the Rings" film trilogy). Let us show you stunning views of these spectacular vistas and bring you on amazing experiences that will allow you to truly discover the richness of New Zealand. 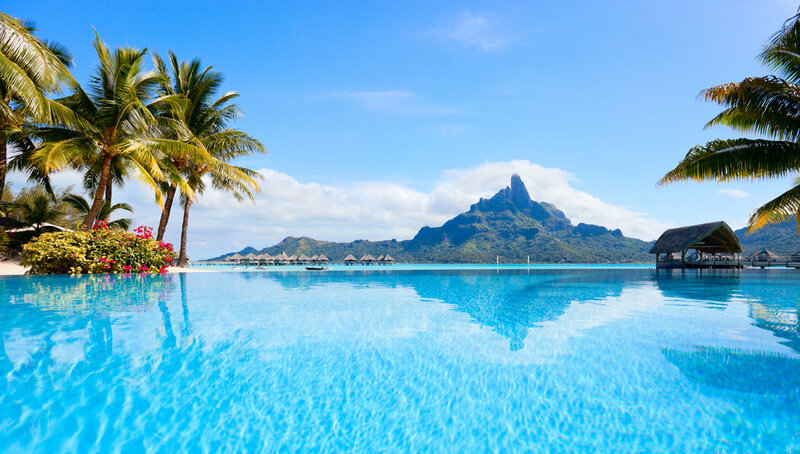 Tahiti has long been the symbol of a tropical paradise! Luxury beaches and islands, swimming with sting rays and sharks, snorkeling with delightful coral reefs and tropical fish, romantic cruises and living in luxurious overwater bungalows. Great food, great drinks and amazing sunsets! You can even take a 4WD around the rugged terrain and visit plantations and villages. We can take you island hopping where you see many of these beautiful islands including Bora Bora and Moorea. Whatever you need, we can set it up including the international flights, reservations, tours and even just set you up in paradise so you can just relax and take it all in. Let us take you there!